for corrections and re-entry success. INEXPENSIVE GUIDES FOR RE-ENTRY SUCCESS! Explore our four pocket guides and a journal by clicking on the above images. The ultimate "Stop Recidivism, Now!" resource collection. 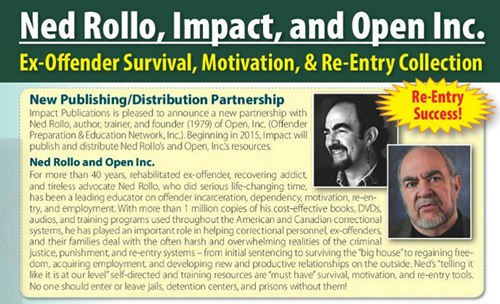 Seven ex-offender re-entry guides provide sound advice on how to transition to the free world...and stay out for good! 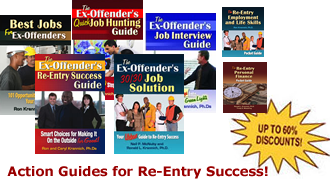 Five 128-page guides address the whole re-entry process as well as focus on one of the most critical aspects of transitioning: finding and keeping a job. The other two books are handy 64-page pocket guides that pull together the key advice of the five books into action guideto be tucked into a pocket or handbag for quick and easy convenience while navigating the job market or personal finances. 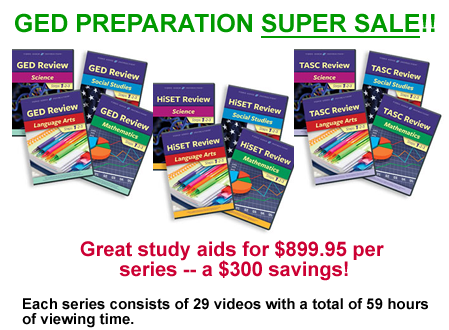 SPECIALS: $59.95 for the set of seven books. Up to 60% discounts on quantity purchases (click here and view the Product Options box for the quantity you wish to order). GED study guides are very popular in corrections settings and on the outside, as inmates and ex-offenders try to improve their academic skills in order to get their GED certificate and open up better job opportunities. Explore the numerous guides available on our related website by clicking here. Click here to read more about this exciting development on our bookstore website! Click on this page to read about barriers faced by people with criminal records and many tips for overcoming the various kinds of barriers that can make transitioning to the outside world and new life difficult. A vast treasure-trove of great resources for dealing with numerous transition issues - special value kits, books, and DVDs. You will find what you need here - and if you don't, please tell us about it. Explore these books that were written to address the needs of ex-offenders and for others seeking an uplifting boost as they try to improve their lives. ©2016 Impact Publications. All rights reserved.